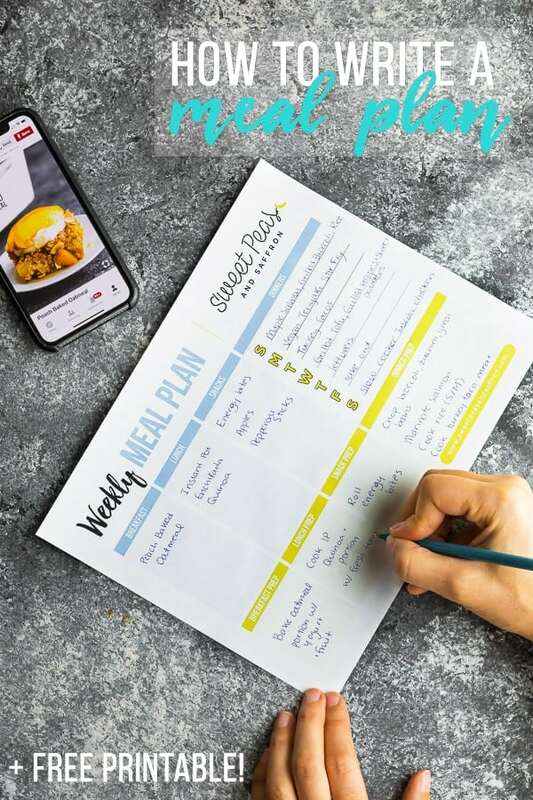 How to write a meal plan- tips on how to get started, how to plan for busy weeks, and how to write a meal plan quickly! Plus a free meal planning template so you can get started. Sometimes, deciding what to cook for dinner is half the battle! I used to spend 15-20 minutes at 5-pm, madly Googling recipes, trying to figure out what to make with what I had in the fridge. It was stressful, and often ended up taking me so much longer to cook than it would have otherwise. These days, I take those 15-20 minutes and spend them at the start of the week, writing down our meals for the week. 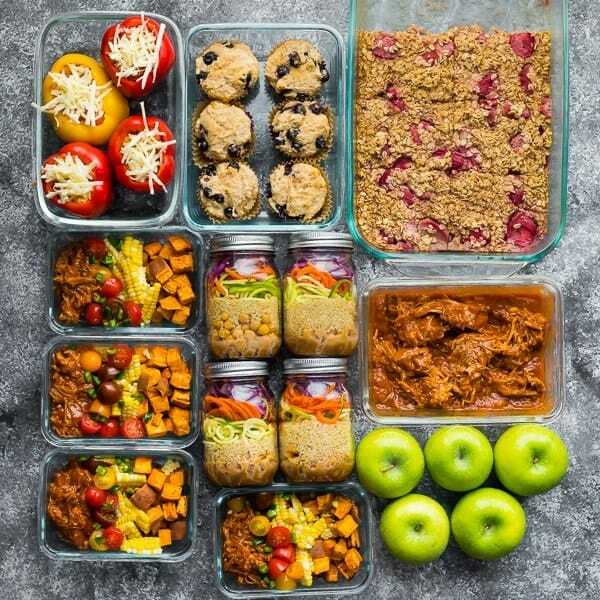 Even if you don’t prep your meals ahead, having a meal plan in place is an easy way to get organized in the kitchen! Writing a meal plan is going to look different for each individual. For me, I like to plan a week’s worth of meals ahead so that I only have to do one grocery shop. 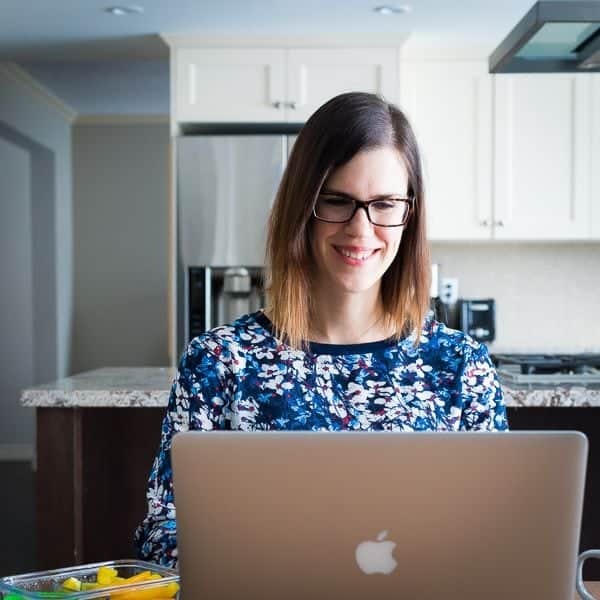 I write out our meals but that doesn’t mean I 100% stick to my meal plan…some nights I just don’t feel like eating what was on the plan and I will repurpose the ingredients for a different recipe, swap it for a freezer meal, or we might order in. But on busy nights when I’m feeling overwhelmed, I refer to my meal plan and it gives me peace of mind. It’s one less thing for me to worry about. It can seem daunting if you consider all meals for the week, so instead, I focus on each meal one by one. I start by writing out our dinners, since we eat something different each night. Next, I add in breakfast and lunches. We often eat the same thing 3-4 days in a row for breakfast and lunch, so they are easier to fill in. You can pick paper (I have a free printable meal plan for you here!) or you can write it on your phone; more often I end up writing it out on an Evernote App on my phone. 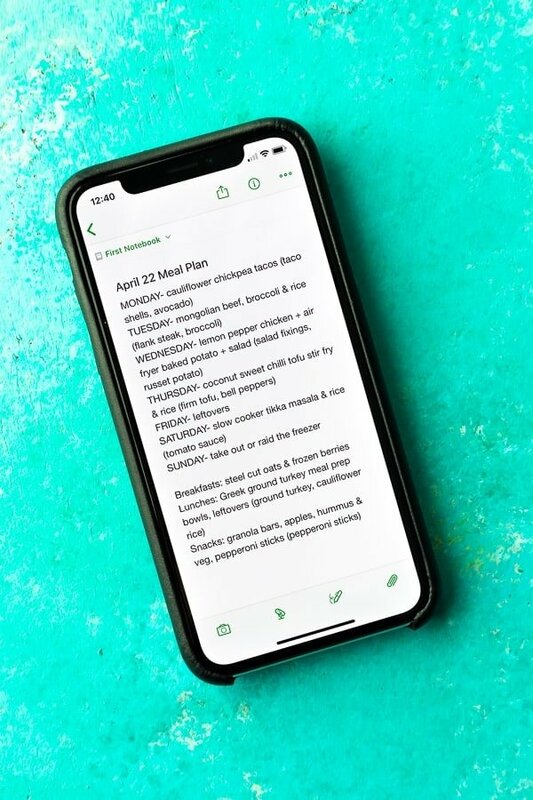 Here’s a post with 5 Free Meal Planning Apps that I use, in case you’re interested! Where to start with picking meals? Check my inspiration boards- aka Pinterest. I have a LOT of Pinterest boards filled with meal prep ideas, and they are my go-to’s when it comes to planning out my meals for the week. Come and check out all my boards! Consider which days I’m not going to want to cook- I hate cooking on Fridays and am really uninspired on the weekends. I try to keep these meals as easy as possible: plan for leftovers or plan to order in! Plan for leftovers- you can make a big batch of something and enjoy for multiple nights, or repurpose for multiple meals. Raid the freezer- this is where meal prep can really be helpful! Stocking up on freezer marinades, soups, stews, freezer slow cooker recipes etc can really help out on those busy weeks. Keep breakfasts, lunches & snacks simple- eating the same thing for these meals all week will make your planning much simpler. Use dependable recipes- sticking to a core set of recipes that you know well and are dependable is also smart for busy weeks. Those are my tips for writing up a meal plan. Did I miss anything? What is your process for writing out a meal plan? I hope you share it with us in the comments! 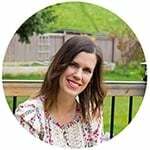 Hi, I’m a new follower and so happy I found your site. I was getting so lost in all the online recipes and such. I really appreciate all your tips, and yummy recipes. I tried the spaghetti squash by cooking it whole, awesome! Hi Sue! Thanks so much for your message. I’m glad you enjoyed the whole roasted spaghetti squash! Let me know if you ever have any questions. Great post! I tried downloading the Meal Prep Cheatsheet, but it never prompted anything. Is there an issue with the link? Hi Nathanael, so sorry I was having some technical issues. If you email me at [email protected] I will send it over to you manually! Hi Afsheen! That’s a great tip. I used to use that app but haven’t added it to my new phone. Thanks for the reminder! What wonderful ideas and what a very useful, well-planned printable! Thank you so much! Thanks for your posts – I’m a new follower and I use Feedly to read blogs. I just learned that reading through that platform doesn’t register as traffic for blogs I read. I just wanted to let you know that the short bullet point summary that you post, which shows up at the bottom of the feedly page where the post is cut off, is really effective – it both serves as a reminder that I should click through to support your blog AND entices me to want to read the rest of each post. Loving all the meal prep recipes. Thank you!